I have not come to speak on behalf of any particular Dharma, like the Hindu Dharma. I have not come on any mission of publicity for any sect or creed or cause; nor have I come to collect followers for any doctrine. I have no plan to attract disciples or devotees into My fold or any fold. I have come to tell you of this universal unitary faith, this Atmic principle, this Path of Love, the Dharma of Prema, this Duty of Love, this Obligation to Love. Why does the sun rise and set every day without delay or disruption? Why do these streams and rivers roar, murmur, and gossip over rock, pebble, and sand, as they meander to the parent sea? This is the answer: Know that I am the One who has ordained that these be such and shall behave so. I am everything, everywhere, omniscient, omnipotent, and omnipresent. My power is immeasurable. Tune into it. When compared to it, the power of the sun is like a baby's breathing to a typhoon. I am ever new and ever ancient. I come always for restoring righteousness, tending the virtuous, and educating the 'blind.' I am the Lord who causes Creation, Preservation and Dissolution. There is no substance, no reality other than Me. I am the Primal Cause and Primal Substance. In this Human Form, all Divine Entities, all Divine Principles -- that is to say, all the Names and Forms ascribed by man to God -- are manifest. 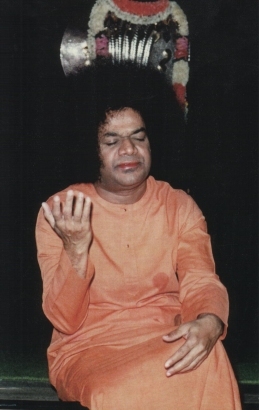 The same Divine Compassion that blessed Dhruva, saved Gajendra, restored Kuchela, and stood by Prahlada has come to Earth as the Lord of all the worlds, Puttaparthi Sathya Sai, the King of kings. I often tell you not to identify Me with this body. You do not understand. You call Me by only one name and believe I have only one form. But there is no name I do not bear and there is no form which is not Mine. Revere any Name of God and the reverence reaches Me. I answer to whatever Name you use. In the years to come, you will experience Me in different manifestations of My Form. I declare that I am in everyone, in every being. The man who dies prays to Me to receive him. The people who weep at his departure pray to Me to keep him alive. I know both sides of the picture -- past and present, crime and punishment, achievement and reward. So I carry out what is ust, though modified by Grace. I am not affected one way or the other by the arrival of some into the world or the departure of others. I require neither food nor sleep. If I needed rest, I would not have incarnated. I have no need to see places. I am everywhere, always! I have no craving for change or recreation. I am always in a state of bliss. My only desire is to share My bliss with you, to encourage you to lead lives full of bliss. Showering bliss is My task. My acts are all selfless, sacred, and beneficial. I have never caused harm. I am the Servant of everyone. I am establishing the path of Truth and Morality, the holy path to God-Realisation. So My work will march triumphantly on. The person who can make Me give up My task in fear has not yet been born nor will he ever be born. The Lord is Love itself. He comes in human form so that you can talk to Him, move with Him, serve Him, and achieve Him. I am the Embodiment of Love. Love is my instrument. Those who have recognized and experienced My Love can assert that they have glimpsed My reality. The path of Love is the royal road that leads mankind to Me. You may be seeing Me today for the first time, but you are all old acquaintances of Mine. I know you through and through. No one can come to Me without My calling him, even if a hundred people persuade, drag, or push him. It is My Will that has brought every single one of you here to Me. No one can understand my Mystery. I hold the universe in My Hand. But devotees learn of My glory and majesty through My personal attention to each one of them. That I hold the universe in My Hand yet at the same time fully care for the lives of My devotees, even to the smallest detail, is a measure of My glory that devotees can understand. No Avatar [Incarnation of God] has done like this before, going among the masses, counseling them, uplifting them, and directing them. In no previous era have men got so many clear intimations of the Advent of the Avathar as now. So use this chance of association with Me as much as possible. Try as quickly and as best you can to follow the directions that I give you. I have now fallen into your grasp, the very Treasure that you have been searching for. Your endeavour should be to draw near to Me and earn My Grace. Let me tell you: There is no need for yoga [exercises], or tapas [penance], or even jnana [knowledge]. I only ask you to fix your mind on Me, to dedicate it to Me. That is all I demand and all that you need to do. Obeying My instructions is enough. It will benefit you more than the most rigorous asceticism. Practise Truth, Righteousness, Peace, and Love, which are dear to Me. Resolve to keep these ideals before you, always, in all your thoughts, words, and deeds. That will confer on you the ultimate good of Mergence in the Supreme Substance of Divinity. Come and stay at Prasanthi Nilayam. Move with Me and experience My company and conversation. I never utter a word that does not have significance or do a deed without beneficial consequence. Listen to Me, watch Me. Then form your conclusions. Dive in and know the depth. Eat and know the taste. To partake of Swami's love, you have to spend nothing except the cost of travel. But even that is a sacred offering. Regard the expenses of your Puttaparthi trip not as a cost, but as a blessing. Without that expenditure, you cannot get this Grace. We have no right to get anything without giving something. Likewise, unless you make some small sacrifice, you cannot have the blissful experience you get here. Come to me, eager to learn, to progress, to see yourself in Me, and I shall certainly welcome you and show you the way. You will indeed be blessed. Don't come with your hands full of trash for how can I fill them with Grace when they are already full? Come with empty hands and carry away My Treasure, My Love. My best gift is Love. Devotees should strive to acquire that. Sai Krishna will install Himself in the lotus of your heart. He will be ever with you as guard and guide and will shower Grace upon you. He will be your Mother, Father, and Preceptor, your Nearest Kinsman; He will be your All in all. Nothing will harm you if you turn your attention toward Him. Bring me the depths of your mind, no matter how grotesque, no matter how ravaged by doubts and disappointments. I will not reject you. I am your Mother. No matter where you go, I will be there, inside you, guiding every step of the way. You are my very own, dearer than dear to Me. I will protect you as the eyelids protect the eyes.